Living in a rural part of the world, I just love to see a red barn. 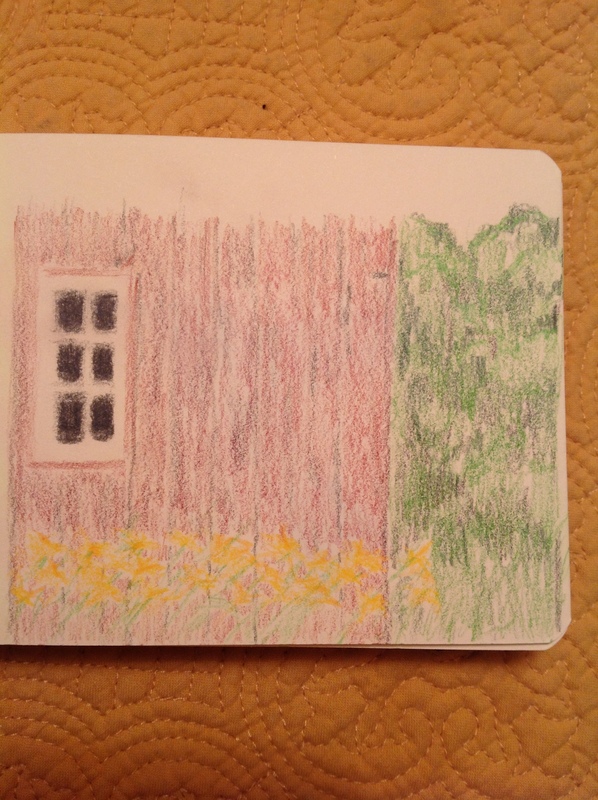 I prefer weathered wood to something newer, and a barn with flowers is even better. Hence, today’s drawing. I’ve not done a lot of landscape work, although I’d like to do more of it. There are so many scenes in the area that would be a joy to sketch or paint. Trees in the distance are much harder to draw than photographs make them look. Um, I need to do many more of these before I’ll be happy with how they turn out. I have to add too that having this blog is kinda like being a little kid and jumping up with a picture to show off. When I release my little pictures out to all of you, I really enjoy seeing which ones you prefer. So far, the ones I like most are the ones you all like best, too. Anyway, it’s a kick, this blogging thing. I start to understand why so many people do it. Hope to see you back tomorrow with a bird that has special significance for me. Happy Wednesday. Yes, blogging does encourage creativity. And the more you do, the more you want to do. I like this drawing very much! Thank you! I’d like to do more of these, but I find them much harder than birds and rodents lol. Trees are hard for me, whether in the distance or up close. I really like the black in the window panes. How do you get the feathery edges around the black? Was it two different pencils? I agree–it is kinda like showing a picture every day. My black pencil wasn’t really sharp and that’s how I got the fuzziness against the white paper. I didn’t work at it at all….I was going for a crisper effect and rushed the drawing a bit. Trees are so hard, I agree. I am better at them when I’m making them out of my head than trying to draw what’s in front of me. Either way, not easy. I love barns too and very nice texture you have created with your barn! The window is my favorite part. It makes your drawing come more to life. Thanks. I was too lazy to sharpen my pencil lol. Wasn’t trying for that effect, but I agree, it does make it look more real. Definitely try it in watercolor too! I should do that, that’s a great idea! Thanks!